EL MONTE – Director of Nutrition Services Dr. Robert Lewis keeps students happy, healthy and productive by offering creative and healthy dishes like cherry blossom chicken with brown rice and broccoli, handmade tamales and pizza with low-fat cheese and whole grain crust. Since joining the El Monte City School District 10 years ago, Lewis enacted programs to fight childhood obesity and secured funding to make breakfast, lunch and supper free to all K-6 students. For those efforts, Lewis was named 2018 Director of the Year by the California School Nutrition Association on Nov. 10. The honor follows El Monte City School District’s recognition by the U.S. Department of Agriculture with HealthierUS Schools Challenge (HUSSC) Gold awards for nine schools and Silver for three others in 2017 for its free meal program. In 2011, Lewis and other administrators met then first lady Michelle Obama as a reward for earning 14 Silver HUSSC awards. The District’s wellness programs have also been sponsored and honored by celebrities like Robert Downey Jr., Chelsea Clinton and Amanda Seyfried. Lewis said his biggest honor is seeing how students and the community have changed their attitudes on nutrition. His department’s latest accomplishment is the inclusion of salad bars, paid for by the Chef Ann Foundation. Lewis said 12 schools now have salad bars; Le Gore Elementary and Columbia School will add the feature before the District goes on winter break. Lewis said students asked for the salad bars through a letter-writing campaign. Lewis said the Nutrition Services Department’s work is nowhere near finished – he plans to hire a third chef, partner with high-profile restaurants to expand the menu and offer bento-style lunch boxes. EMCSD_DIRECTOR1: El Monte City School District Director of nutrition services Dr. Robert Lewis, center, holds his 2018 California School Nutrition Association (CSNA) Director of the Year award. He is joined, left to right, by CSNA Vice President Johnna Jenkins, CSNA President-elect Polly Houston, CSNA President Kim Eckholm and CSNA Awards Committee Chairwoman Amber Watson. 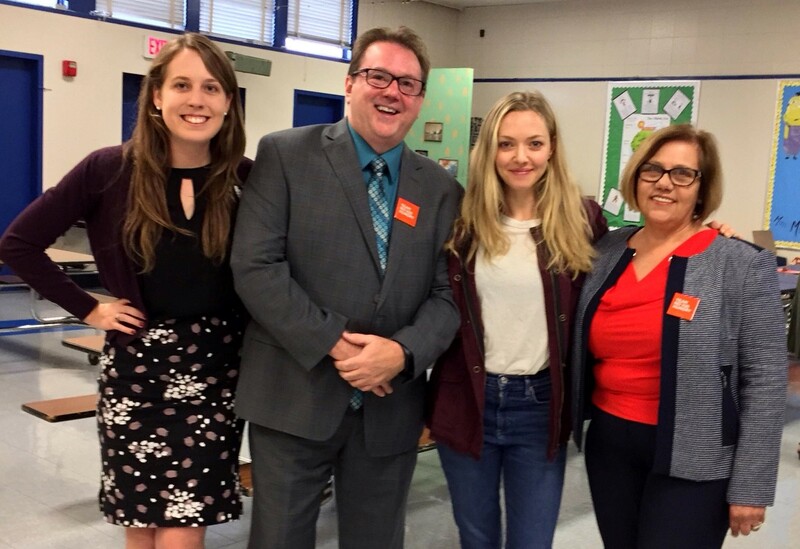 EMCSD_ DIRECTOR2: El Monte City School District Director of Nutrition Services Dr. Robert Lewis, Project Coordinator Caitlin Waylom, P.D., left, and Operations Coordinator Nellie Garcia, right, meet with actress Amanda Seyfried at Rio Vista Elementary School. Seyfried visited the campus through the Share our Strength organization, which aims to end childhood hunger, to highlight the District’s free meal program. 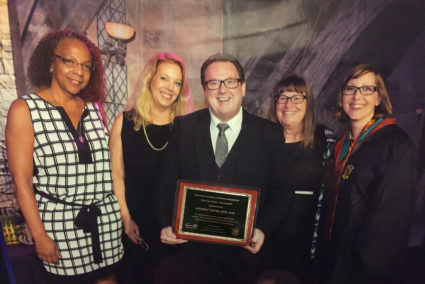 El Monte City School District Director of nutrition services Dr. Robert Lewis, center, holds his 2018 California School Nutrition Association (CSNA) Director of the Year award. He is joined, left to right, by CSNA Vice President Johnna Jenkins, CSNA President-elect Polly Houston, CSNA President Kim Eckholm and CSNA Awards Committee Chairwoman Amber Watson. El Monte City School District Director of Nutrition Services Dr. Robert Lewis, Project Coordinator Caitlin Waylom, P.D., left, and Operations Coordinator Nellie Garcia, right, meet with actress Amanda Seyfried at Rio Vista Elementary School. Seyfried visited the campus through the Share our Strength organization, which aims to end childhood hunger, to highlight the District’s free meal program.